I'm excited to be able to share the Colors by llarowe Xmas/Hanukkah 2014 Collection with you today. This collection has some stunners in it. 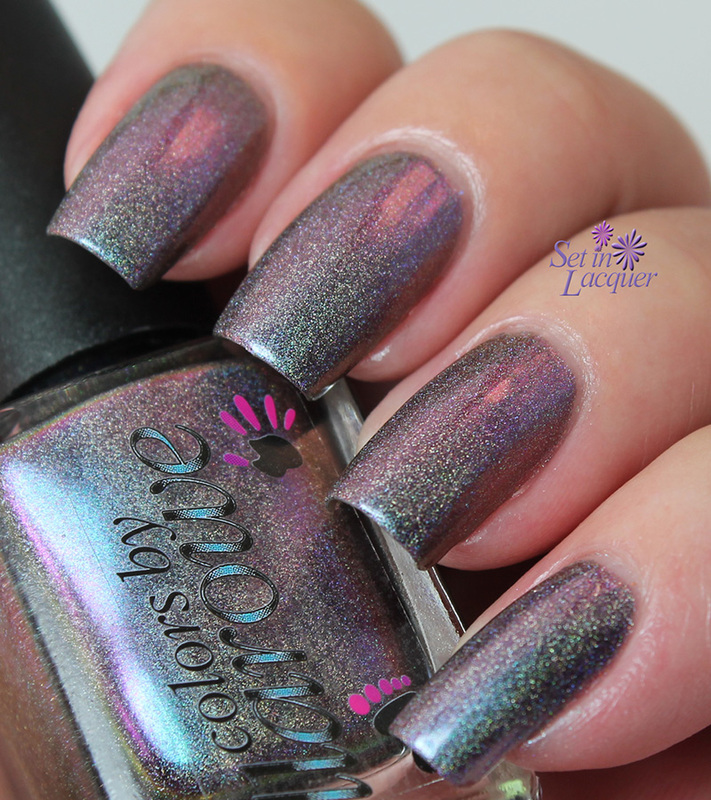 Multi-chromes, glitters, holos... Oh My! 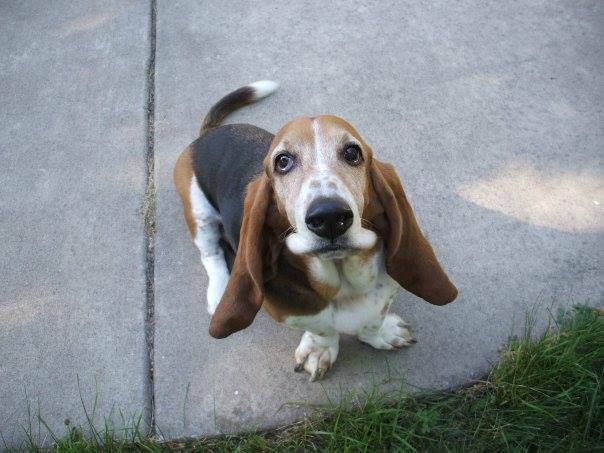 I am going to post a few posts so it isn't so photo heavy. 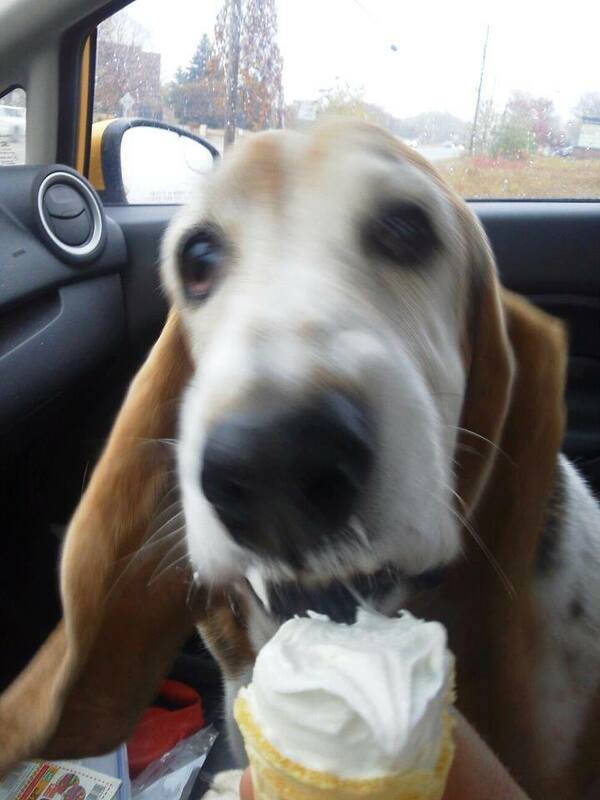 I had a difficult time choosing between photos - so there are quite a few. But these polishes have so many personalities that they need multiple photos. As part of Llarowe's Black Friday sale, this collection will be offered at a discount of $1 off each bottle IN STORE ONLY (meaning the physical Llarowe store in CO). Xmas/Hanukkah 2014 Collection will launch as a pre-order on the Llarowe website December 1st. A discount of $1 per bottle will be offered if the whole set is purchased. Now, let's get to the real reason for this post - the polishes! 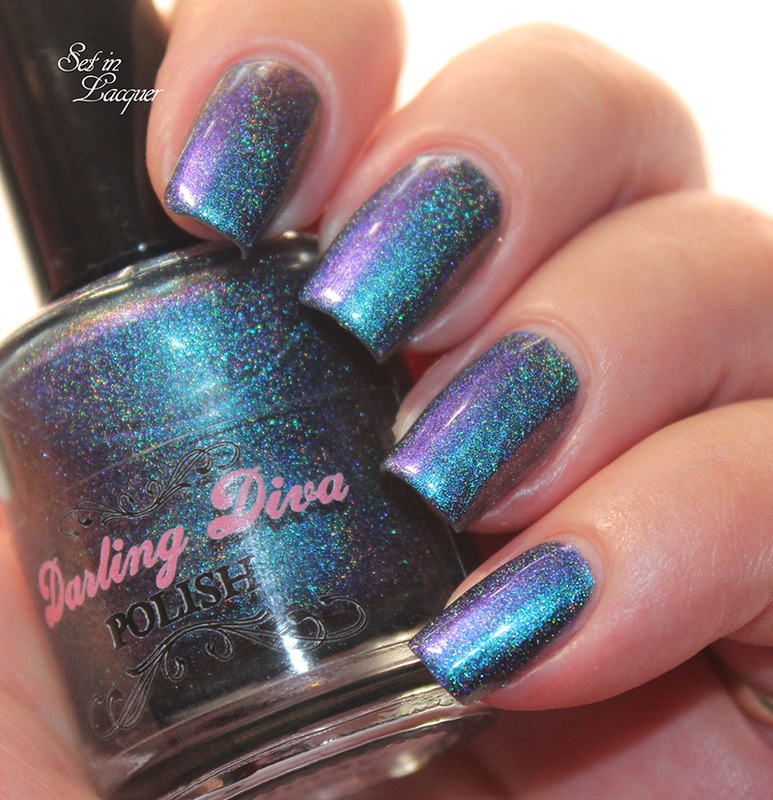 Bells Will Be Ringing is a teal to pink to purple multi-chrome with intense scattered to linear holo. 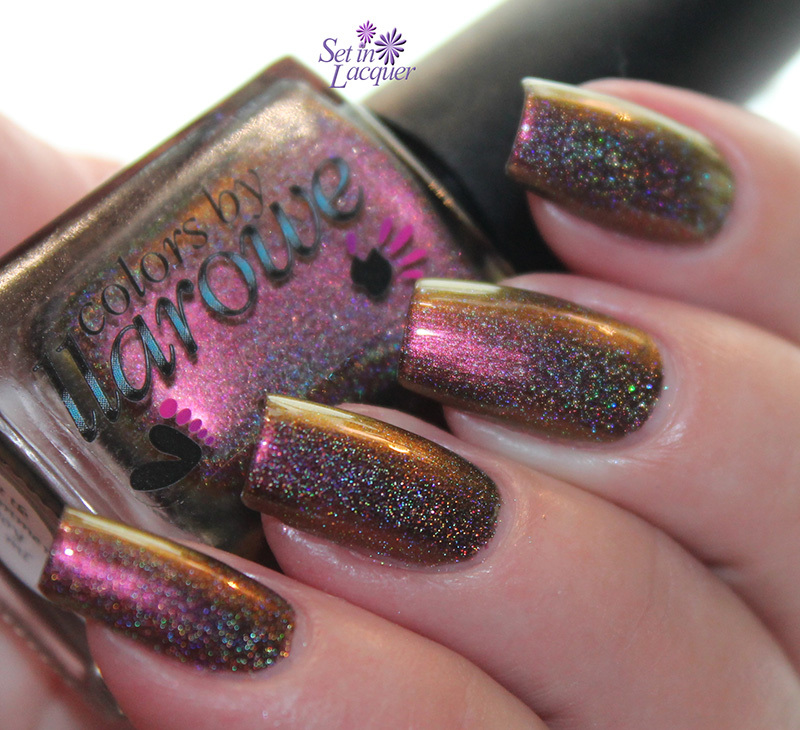 This shade has truly magical color shifts and the holo illusion just adds to the depth and overall appearance of the polish. Every movement of the nail and every change in light transforms the look. This is one of my favorites of the collection. This is two coats with a top coat of HK Girl. 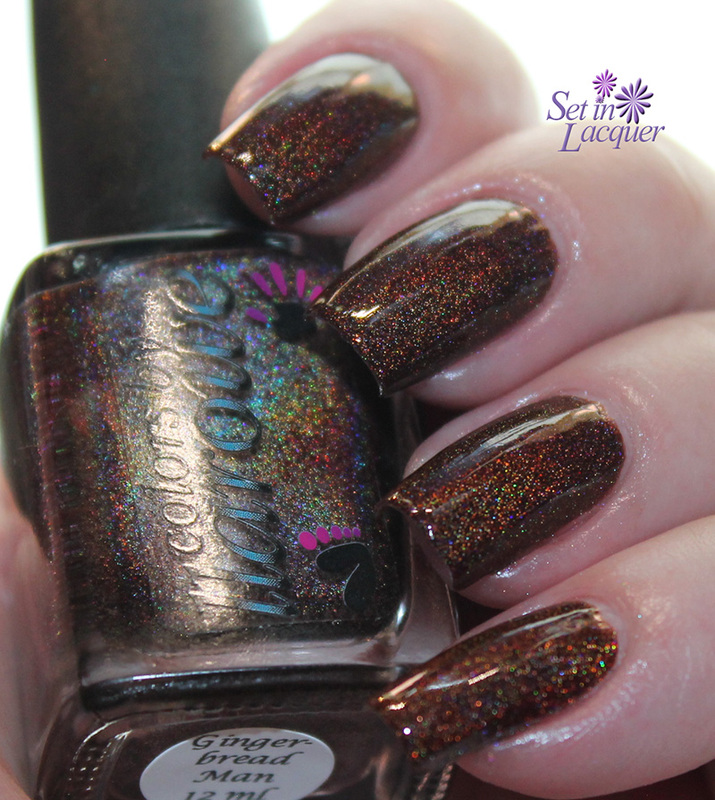 Gingerbread Man is a gorgeous, deep chocolate brown. This scattered holo with golden, green and blue arc has that "lit from within" look. I had a hard time capturing all the color prisms in the photos; but they are there and aren't shy at all in real life. This amazing polish is sure to please. This rich polish is classy and deep in color. This is two coats with a top coat. Here it is with direct, bright light. I Holla for Challah! is a deep royal blue with amazing shimmer. I am partial to blue polishes and this crelly base with intense light blue, violet and aqua shimmer makes me realize why. This deep blue shade has the "lit from within" appearance that I adore. This polish dries semi matte and has a slight (very slight) texture. This is two coats with a top coat. Colors by llarowe - I Holla for Challah! Little Drummer Boy is my positive favorite from this collection. This shade has a mesmerizing high-gloss finish and the multi-chrome effect is sure to be an eye-catcher. It has a copper to pink to gold multi chrome shift. 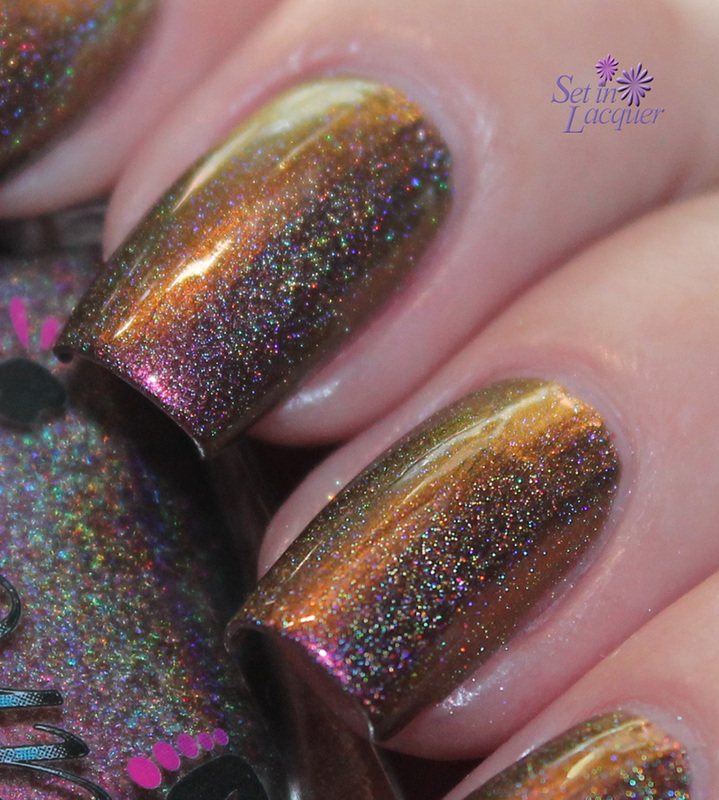 The intense scattered to linear holo adds depth and dimension. You might want to wear gloves when you are driving so you don't get distracted by the gorgeousness of it. This is two coats with a top coat. Here is why I said to wear gloves. Look at this beauty in direct light. See part two of the collection here and part three here. 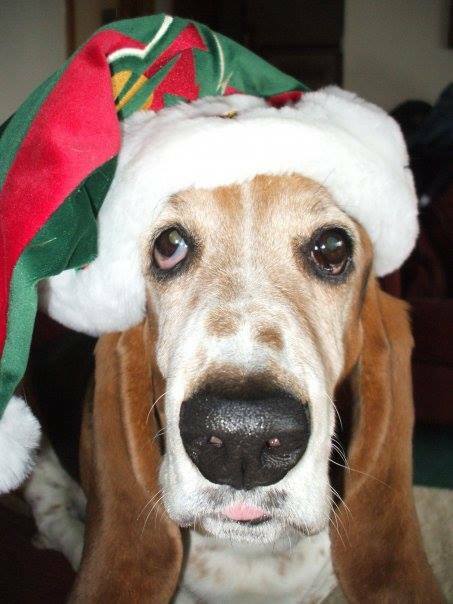 The Xmas/Hanukkah 2014 Collection can be purchased on December 1, 2014 at llarowe.com. Follow llarowe on Facebook and Colors by llarowe on Facebook to keep up with new collections, releases and specials. I know, I know... 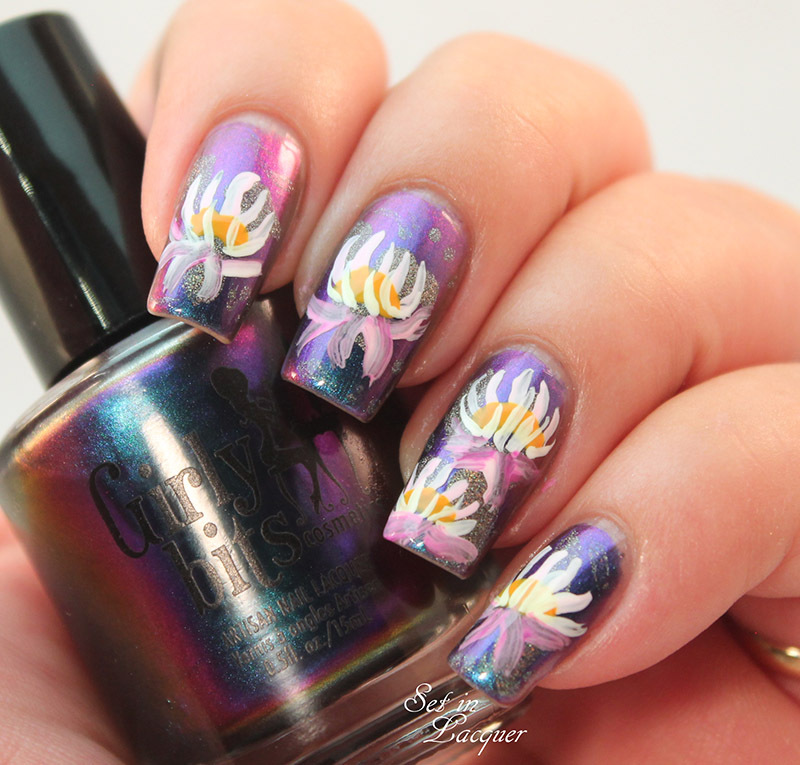 It's another floral nail art look. While I don't lean toward floral prints in my day-to-day life, I do love floral themed nail art. 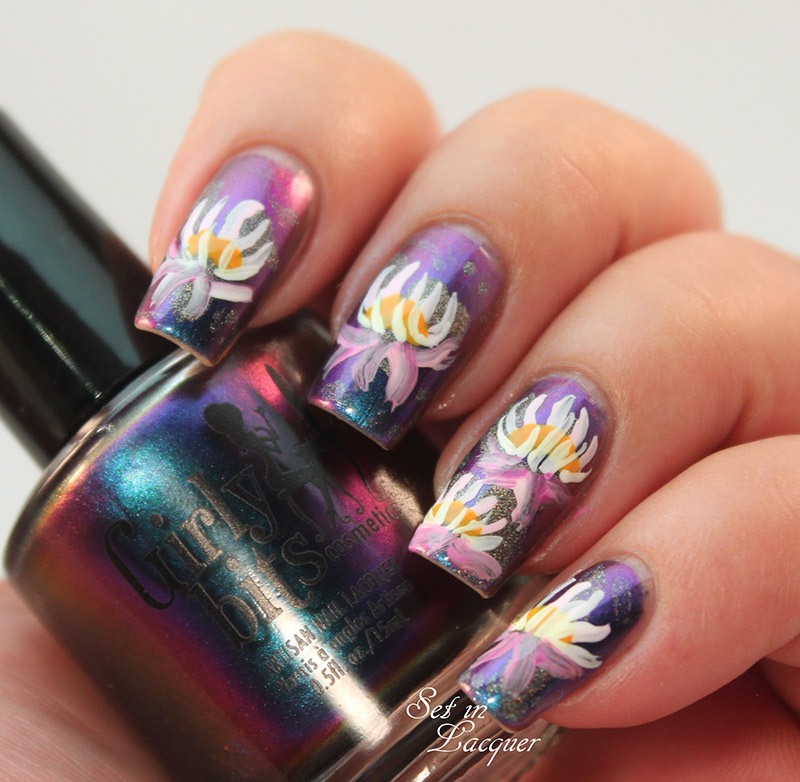 And when you have water lilies over a multichrome polish? Well, it's just mesmerizing. I added a few splotches (yes, it's a technical term) of Girly Bits Dash Away All for some extra dimension under the water lilies. 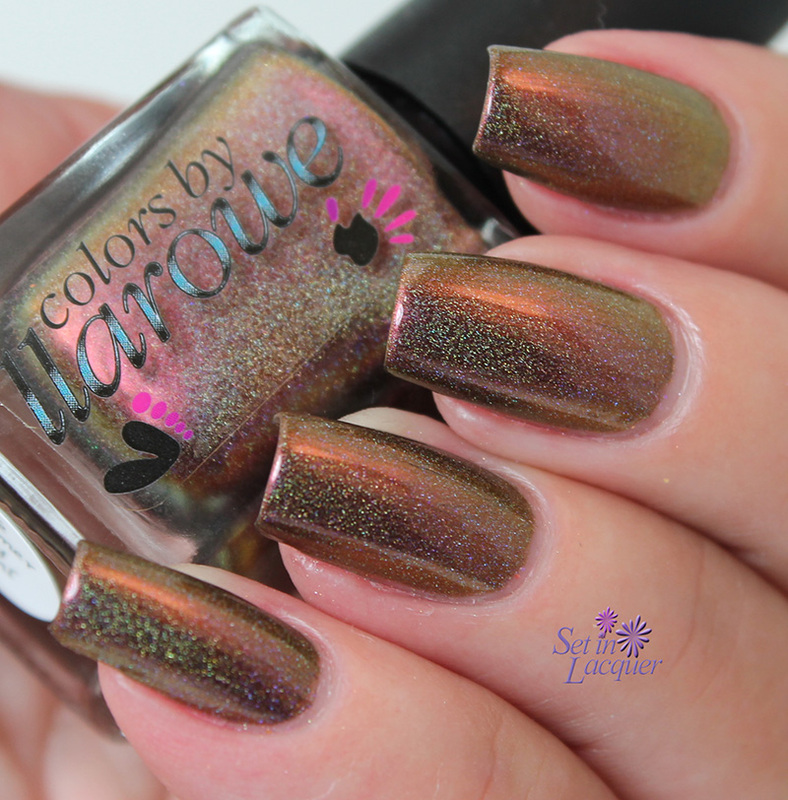 It is an amazing linear holographic shade of taupe. It's great to wear on its own, or as an accent. Then I used acrylic paint to create the water lilies. I use acrylic paint a lot in my nail art. It's easy to use, can be easily thinned, it's inexpensive and is readily available. And it can be easily "erased" if you find you make a mistake. 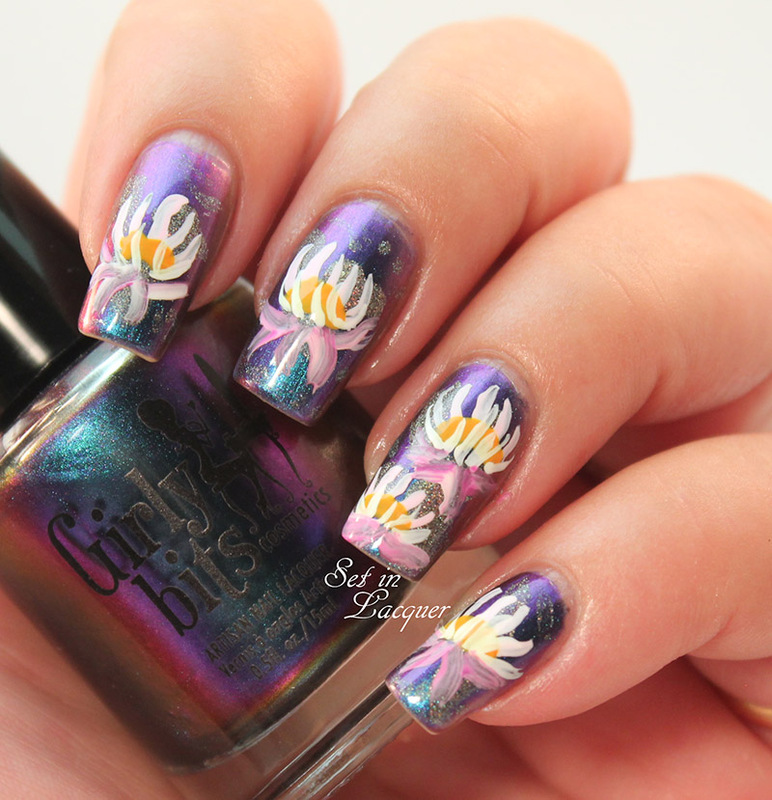 I love the soft and delicate look of the water lilies, and yet the base color makes it dramatic and eye catching. These polishes were previously sent to me for an honest review. All opinions are my own.